For me, the summer has the potential of messing with the morning routine that I stick to during the school-year. Wake. Make and check "To-Do" List. Coffee. Devotional. Work-out. I've fought to stick to these daily habits since January, and have been successful (for the most part) of not straying from this schedule. Knowing that the summer schedule would be a bit lazier, I thought ahead and challenged my Mom to Mom group to take the summer to journey through "100 Days of Blessing" by Nancy Campbell. Nancy is NOT a best-selling Christian author. Her book has NOT been made into a glossy, made for group bible-study-package, complete with dvd's, workbooks, and rubber wristbands. I'd never even HEARD of Nancy until a mother I respect mentioned on her blog that she was chewing on what Nancy had to share in this devotional, and was actually struggling through some portions. Nancy's goal? To bless you with 100 powerful and challenging devotions to strengthen, encourage, and inspire you in your divine calling as a wife and mother. And frankly, on many days, what she shares stings a bit. She makes no apologies for her convictions (something I love and admire), and while I may not hold to all her beliefs, not a day has gone by that I haven't been moved to make an adjustment or change based upon her content. Investing the summer in reading this devotional along with my fellow Mom to Mom participants has kept me consistent, for I've been committed to both reading every morning, as well as emailing a brief nugget based on that day's entry. 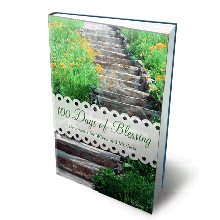 "100 Days of Blessing" can be purchased at Above Rubies Book and Music Store. She may make you mad at times. This isn't "feel-good" content. But, if you are a wife and/or mother you WILL walk away encouraged that your call to be so is held in the highest esteem by God. So in that respect - it does feel good - however, you won't land on that truth through constant stroking. Nope, she'll make you work a bit to land there.